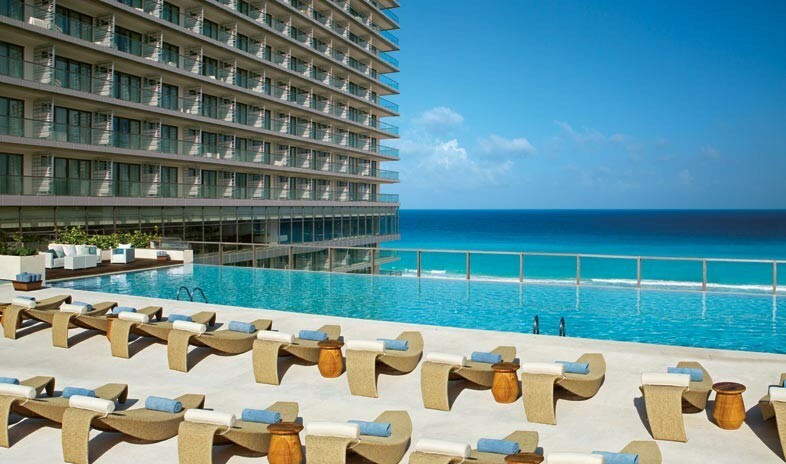 Secrets The Vine Cancun provides superior amenities for groups in a chic, contemporary 28-story high-rise between the beach and lagoon in Cancún, Mexico. Reserved for adults only, and opened in 2012, the all-inclusive hotel celebrates fine wine in its theme. The lobby, for instance, includes a wine-tasting area known as the Enoteca, which features a Mexican handcrafted table with seating for 14 guests, a wall of wines holding up to 3,000 varieties, and sommelier-led tastings of some of the world's finest vintages. The property—AMResorts's first in Cancún's Hotel Zone—also features 497 luxury lodgings and 17,000 square feet of conference space, four pools, ocean sports, an elaborate spa and fitness center, six bars and lounges, and eight restaurants ranging from an international buffet to a la carte dining at Dragons, Bluewater Grill, Mediolo, and Olio.